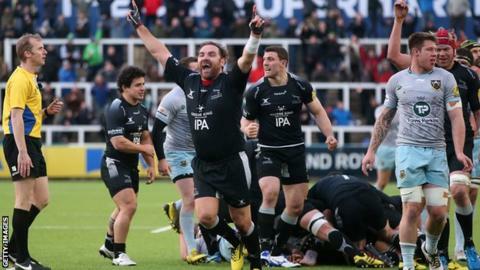 Premiership strugglers Newcastle edged past play-off chasers Northampton at Kingston Park to move up to 10th. Newcastle took a 20-11 lead into the break thanks to tries from Alex Tait and Chris Harris, alongside the boot of Andy Goode, with Jamie Gibson scoring an unconverted try for Saints. Goode then extended his side's lead to 15 points with two penalties. And despite Saints captain Lee Dickson touching down twice, Newcastle held out for a one-point victory. The win lifts Falcons above Worcester and gives them a seven-point cushion over London Irish, who lost to second-placed Exeter on Sunday. But Saints, who had come into the game on the back of five wins from six, will be unhappy with allowing the game to get away from them after exchanging points in a free-flowing first half. After Newcastle had Marcus Watson's try disallowed, Tait put down a Goode long pass out wide, before Gibson was driven over by his team-mates to make it 7-5, Stephen Myler missing the kick. Harris took advantage of Micky Young holding off Dickson to score Falcons' second try, while Goode and Myler both scored two penalties in the first half. After veteran Goode furthered his side's advantage, Northampton responded through Dickson, who spotted a gap to touch down, before finding himself under a pile of bodies to score his second try, and JJ Hanrahan's conversion brought them to within one point with 13 minutes to go. But Newcastle held out for victory at Kingston Park, where they have lost just once in their last eight matches. Newcastle director of rugby Dean Richards: "The quality of our play in the last three or four games has been top drawer and we won today against a quality side - it was one of our best performances. "We showed lot of character and effort but I think there is a lot more to come from this side. "I think we missed at least four try-scoring chances but I'm sure Northampton can say the same. At the moment the boys are pretty confident and they are pretty much marshalling themselves which is a good sign." Northampton director of rugby Jim Mallinder: "The referee made a couple of big calls. But I'm not going to blame him - we have to look at ourselves. "We conceded too many loose points early on. We talked about playing the full 80 minutes but despite being on top in the forwards we didn't convert that into points often enough. "A win would have pushed us towards the top four but there is still a long way to go this season - we just need to regroup and sort things out." Newcastle: Hammersley; Tait, Harris, Powell, Watson; Goode, Young; Vickers, Lawson, Vea, Wilson, Robinson, Wilson, Welch (capt), Hogg. Replacements: McGuigan, Rogers, Hatakeyama, Furno, Latu, Takulua, Willis, Socino. Northampton: Foden; Elliott, Burrell, Mallinder, Wilson; Myler, Dickson (capt); Waller, Haywood, Brookes, Craig, Day, Gibson, Wood, Dickinson. Replacements: Marshall, Waller, Denman, Matfield, Harrison, Kessell, Hanrahan, G Pisi.